Emanuel Gottlieb Leutze is a German-born American historical painter who is best remembered for his painting Washington Crossing the Delaware (1851, Metropolitan Museum of Art, New York), one of the most popular and widely reproduced images of American history. Another important work by Leutze is Westward the Course of Empire Takes Its Way (1861), a 20-by-30-foot mural in the United States Capitol building illustrating the settlement of the Far West. Leutze was born in Wurttemberg, Germany in 1816. His parents moved to the United States in 1825 to avoid political persecution. They settled first in Virginia and then Philadelphia. After his father’s death in 1831, Leutze was forced to abandon his schooling so he could help support the family. For a short time, he worked as a traveling portrait painter, earning up to $5 a picture. In 1834 he started studying under the London born painter and printmaker John Rubens Smith (1775-1849). Two years later, he received his first serious commission. He was asked to paint portraits of famous figures for publication in the National Portrait Gallery of Distinguished Americans. Unfortunately, he was unable to complete the project. Luckily, the few history paintings he made at this time attracted considerable praise, and he was encouraged to continue his studies in Europe. Supported by generous patrons, he returned to Europe in 1841. After a short stay in Amsterdam, he enrolled in the Düsseldorf Royal Art Academy, which was famous for its teaching of historical painting and landscape painting. Between 1842 and 1844 he studied under the romantic artist Wilhelm von Schadow (1789-1862) and the celebrated romantic painter Carl Freidrich Lessing (1808–80). In 1842, he unveiled his Return of Columbus in Chains to Cadiz, which bought him fame and a gold medal at the Brussels Art Exhibition. He quickly became disillusioned with the rigors of the Academy and embarked on a study-tour of Germany, Switzerland and Italy. He returned to Düsseldorf in 1845 and established his own studio. Soon after, he became one of the most popular American artists living abroad. Leutze began his first version of Washington Crossing the Delaware in 1849. This massive work (12 feet high and 21 feet wide) depicts the moment when General George Washington led the American revolutionaries across the Delaware River (1776). Many believe that his famous portrayal of the American Revolution is influenced more by the Rhine River in the northern part of Düsseldorf, than the Delaware River on the Atlantic coast of the United States. In 1850, a fire in Leutze’s studio damaged the original Washington Crossing the Delaware. Although restored and acquired by the Bremen Kunsthalle, this version was destroyed again in a bombing raid in 1942. Leutze began a new version of Washington Crossing the Delaware, which was finished and placed on exhibition in New York in October of 1851. At this showing Marshall O. Roberts bought the canvas for the then-enormous sum of $10,000. The Washington Crossing the Delaware that currently hangs in the Metropolitan Museum, a gift of John Stewart Kennedy (1897), is Leutze’s 1851 copy of his original work damaged by fire in 1850. In 1852 Leutze returned to Düsseldorf and was awarded a number of important commissions. He gained a reputation among his German colleagues as a leader of the nonacademic artists’ community. In spite of his fondness for life in Germany, Leutze thought of himself as an American. He returned to the United States in 1858, and won a commission by the U.S. Congress to decorate a stairway for the meeting chambers of the House of Representatives. He established a studio in New York and began working on his mural Westward the Course of Empire Takes Its Way, still visible in the Capitol building in Washington, D.C.
Leutze spent much of the remainder of his life in America. He remained active in the arts and was a strong advocate of the National Academy of Design. Leutze died in 1868 from heatstroke, at the age of 52. 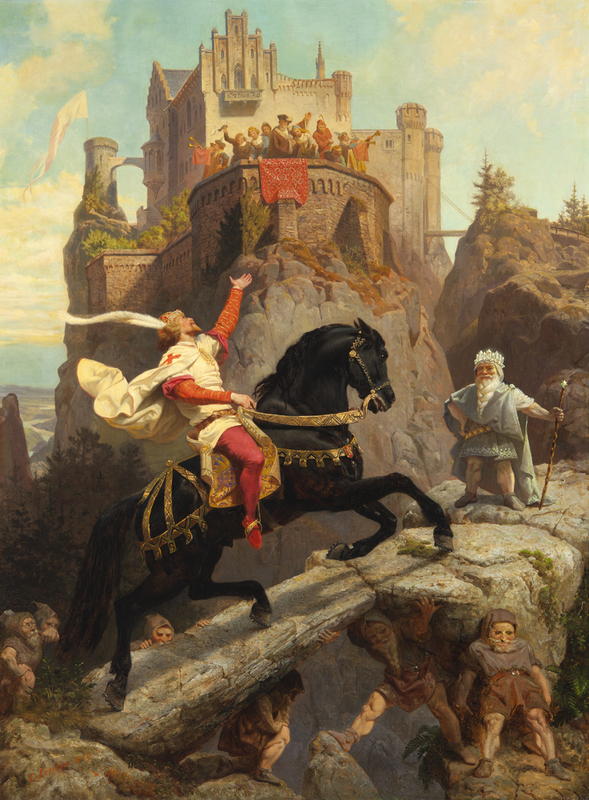 The Knight of Sayn and the Gnomes is a scene from a German ballad in which Ermengarde, daughter of a squire, is promised to Kuno of Sayn if he can ride his horse up the rocky cliff to her father’s castle. With the gnomes help, the knight completes the journey and the fair Ermengarde is his forever!